Designed as magnets, these invitations for Mason and Jett's Christening were created to complement each other and look great as a set! 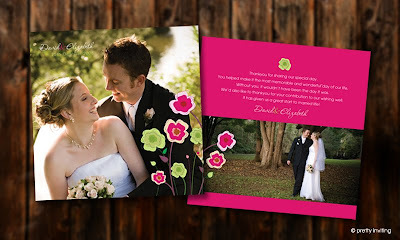 Craig & Kate loved the Spots & Stripes design range and wanted to have the stationery printed using their wedding colour theme of mint green, pinks and white. Fresh and minty, this package consists of invitations, reply cards and placecards (with menus and table chart yet to be produced). 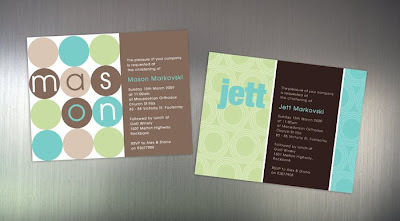 The metallic stock enhanced the already vibrant colour palette and metallic envelopes in a matching stock completed the look.